The ever growing selection of trucks features 15 licensed trucks from 7 different manufacturers. All of the trucks have been closely recreated in game with supervision of our licensing partners to ensure that driving any of the trucks featured in the game feels just the same as taking them for a spin in real life. 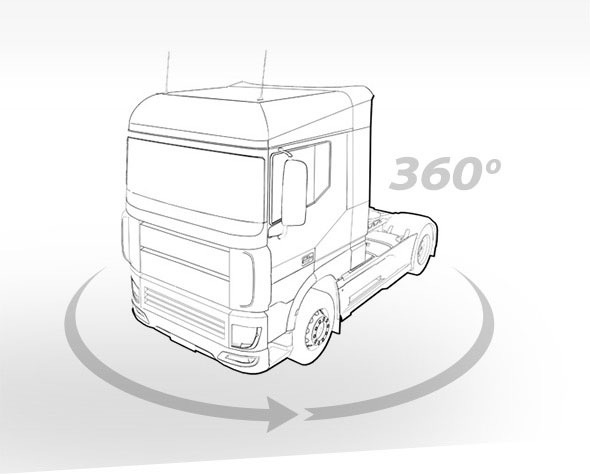 Explore all of our trucks and experience them in full 360° view. 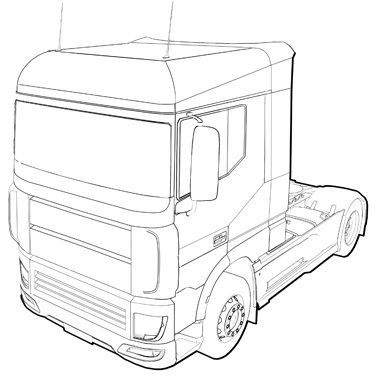 Every truck can be customized in a countless number of ways - starting from selecting cabin size and chassis, through engine and transmission selection to endless amount of cosmetic elements, ranging from side skirts, mirrors and various light setups to paint jobs that add a personal touch to your vehicle. All of these options allow you to tailor the truck you drive to your exact preferences. There is no set career path in Euro Truck Simulator 2 - every player is given the opportunity to create a character and grow their skills as they see fit: various strategies can open different opportunities early in the game allowing you to to make most of it and shape your progress as you see it! As you work you gain valuable experience. The more distance you cover, the more experience you gain. Eventually, this earns you skill points which you can assign here to highlight your trucking skills. Better skills unlock new job options as companies become more confident of your expertise and start to offer you better jobs with, of course, a higher reward. I’ve just got my very first garage in Kassel - it’s not much right now, but it will certainly get me started on the right track. The paperwork required to create my own company was a bit of a hassle, but it will make all the accounting easier on the long run for me. After getting comfortable with my property, I should go look around the freight market for a quick job to make some quick money with easy deliveries. That way I can get some money towards my first truck. The game does not end after you buy your dream truck - Euro Truck Simulator 2 allows you to grow a vast shipping company from the comfort of your home - you have a full choice of who to hire, what trucks they will drive and how your company will grow in future. Become your boss and start your own company. The world of Euro Truck Simulator 2 spans across 16 European countries featuring closely recreated environments, roads, cities and landmarks. The in-game world will make anyone feel as they are traversing across the continent with its ever-changing vistas, live traffic, impressive lighting and weather system that makes the entire world alive. A country famous for its beer and automotive industry covers 78,866 square km. Prague, which is the capital city, is one of the world's most popular tourist destinations. The Czechs have 54,997 km of paved roads, 1,234 km of which are motorways and expressways. Germany covers an area of 357,021 square km. Tourists love German old towns, castles and beer festivals. Berlin is a capital city and one of the world's most popular places to visit. Germany has 650,000 km of roads, its autobahn network has a total length of 12,917 km. With its area of 547,030 square km, France has 1,027,183 km of serviceable roadway. France is also a very popular tourist destination: people come to visit famous vineyards, ski resorts and of course Paris, one of the world's most beautiful and romantic cities. Italy is a country famous for its cuisine, fashion, art and architecture. It covers an area of 301,338 square km and has a total of 487,700 km of paved roads, 6,700 km of which are motorways. It has both great ski resorts in the Alps and lovely beaches by the sea. Austria's terrain is highly mountainous. Only 32% of the country's area of 83,879 square km is below 500 metres. Its capital city is Vienna. The Arlberg Road Tunnel with a length of 13,976 metres is Austria's longest road tunnel and the 5th longest road tunnel in the world. The total area of Poland is 312,679 square km. Poland has 280,401 km of paved roads, 2,820 km of which are motorways and expressways. Polish capital Warsaw offers wonderful examples of architecture and about a quarter of the city is filled with parks and gardens. One of the world's most powerful countries has an area of 243,610 square km. The capital city is London an important financial and cultural centre. Unlike most countries in the world, British traffic drives on the left. Also, miles are used instead of kilometres. Belgium covers an area of 30,528 square km. There are 118,414 km of roads, among which there are 1,747 km of motorways. Belgium is divided into two parts which use different languages. That's why road signs in Belgium are either in Dutch or French. The capital city is Brussel. With its area of 2,586 square km, Luxembourg is one of the smallest nations in Europe. The motorways cover a total distance of 147 km while the remaining road network accounts for a total length of 2,820 km. The city of Luxembourg is an important banking centre. Only about half of the Netherlands 41,543 square km area exceeds one metre above sea level. The total road network of the Netherlands has 139,295 km, including 2,758 km of expressways. Amsterdam, the capital city, is famous for its nightlife and numerous festivals. The country famous for its banks, chocolate and watches covers an area of 41,285 square km. Swiss capital city Bern is notable for its old town centre and a number of heritage sites. Switzerland has 71,345 km of roads, total length of the autobahn network is 1,638 km. Slovakia is famous for its car manufacturing. The country covers an area of 49,000 square km. It has 38,085 km of paved roads, including 419 km of highways. The most popular destinations are the capital of Bratislava and the High Tatras, the highest Slovakian mountains. Hungary is a popular tourist destination. Its capital Budapest offers a number of historical buildings, baths and parks and is considered a financial hub. Hungary covers an area of 93,030 square km and it has 70,050 km of paved roads, including 1515 km of motorways. Norway has a total area of 385,252 square km. It is one of the oldest kingdoms and also one of the largest producers of oil and natural gas. Its capital Oslo is the fastest growing major city in Europe. Norway has 72,033 km of paved roads and 664 km of motorways. Denmark consists of the peninsula of Jutland and 443 named islands. It has an area of 43,094 square km. The road network totals 73,197 km of paved road, including 1,111 km of motorway. Danish capital city Copenhagen is one of the world's most bicycle-friendly cities. With the land area of 450,295 square km, Sweden has 162,707 km of paved road and 1,428 km of expressways. About 15% of the country lies north of the Arctic Circle. Swedish capital city Stockholm is famous for its metro - the stations are full of modern art. Latvia, being one of the three Baltic states, it shares its border with Estonia to the north and Lithuania to the south. The total area of Latvian territory is 64 589 km2. The most famous travel spot is the capital Riga, whose Old Town is a World Heritage Site. There are many other great places to see, both urban and rural alike which connects 14601 km of paved roads. Estonia is the most northerly of the three Baltic states, it has an area of 42 388 km2 (including 2222 islands). Estonia's population ranks among the smallest in the world. Capital city Tallinn's Old Town is one of the best preserved medieval cities in Europe. While the country has charming old towns and heritage back to the Hanseatic League, it is a leader in technology. There is 12 923 km of paved roads - including 99 km of limited-access roads. Lithuania is with 65 300 km2 the largest and most southerly of the three Baltic republics. It has 12 912 km of paved roads. Lithuanians are fond of nature and have a strong feeling of a shared culture that begins as early as primary school, where folk music, national traditions, and holidays play an important role. Vilnius (capital) University is an important scientific and education centre on the European scale. Finland extends into the Arctic, where the Northern Lights and the Midnight Sun can be seen. The country has comfortable small towns and cities, as well as vast areas of unspoiled nature. Capital city Helsinki has one of the highest urban standards of living in the world. About 10% of the 338 424 km2 area is made up by 188,000 lakes, with a similar number of islands. Roads in Finland comprise 78 141 km of highways, paved and gravel roads. Helsinki has one of the highest urban standards of living in the world. Russia is the largest country in the world by area 17 125 200 km2. While geographically mostly in Asia, the bulk of Russia's population is concentrated in the European part together with capital Moscow and, culturally, Russia is unmistakably European. It boasts a rich history and culture. Road safety in Russia is poor, with a road accident rate higher than in Europe or the United States. The modding community around the game creates amazing modifications of almost every nature - anything you imagine can be added as a mod for the game. The community created content varies from simple cosmetic mods that change looks of your trucks, to fully new trucks and even map extensions being created on regular basis.